Tetris can be an intense game no matter what mode you're playing. If you're going up against the computer, it can feel like the odds are stacked against you. Playing against others online always makes your palms sweaty and your hands a bit shaky. Meanwhile, local multiplayer puts you in the same room as your competitors, and they're ready to do whatever it takes to crush you. You'll need to be at the top of your game for any and all Tetris challenges! While there's plenty of pressure-filled moments in Tetris, which one has caused you the most stress? I know my choice without a doubt. I've played countless games of Tetris, and my time includes numerous hours spent playing online, local, and everything else in-between. While one-on-one battles are certainly grueling, and 4-player battles dials things up quite a bit, those multiplayer games are nothing compared to a 6-person local multiplayer challenge! Yes, believe it or not, some Tetris games let you experience a local multiplayer battle with 6 players. If you thought playing against a friend or two was tough, try going up against 5 opponents! A 6-player battle means you have more Tetris garbage than ever to worry about! You can get squashed in a matter of seconds, depending on how hard-hitting your opponents are. It truly is a situation where anyone can come out the winner. I've actually played a lot of 6-player Tetris games over the years. Every single person adds something new to the experience, as well as another big reason to worry. When you're going up against a single opponent, you can get a feel for how they react to certain situations. You only have one challenge to focus on, and can learn how they tick. Trying to take that approach and adding 5 others into the mix makes for pure insanity. For me, the most intimidating part of a 6-person Tetris battle comes from an unlikely source. During a Tetris game, nothing makes the hairs on the back of my neck stand up more than the sound of a Tetris Line Clear. This means some major garbage is heading your way, no matter how many opponents you're playing against. As soon as I place my active Tetrimino, I'm about to be hit with a wall I might not come back from. Now imagine hearing that sound time and time again, coming from 5 different sources. Your game could literally be over before you even have a chance to play! On the flip-side, there is one positive thing I'll say about a 6-player Tetris game. The feeling of victory will never be sweeter! You can plug away all you want and try your best, but these games are so random you might never pull out a win. If somehow you're lucky enough to be crowned the victor, get ready for a celebration unlike any other. We're talking about ultimate bragging rights in this situation. If you can survive a 6-player match, you're ready for almost any other challenge Tetris can throw at you! Do 6-player Tetris games scare the heck out of me? You bet they do. Am I going to jump in the next time some friends want to set up a match? There's no doubt about it! While it's crazy and relentless the entire way through, the most important thing is how much fun the experience is. The chaos can be a wonderful thing! 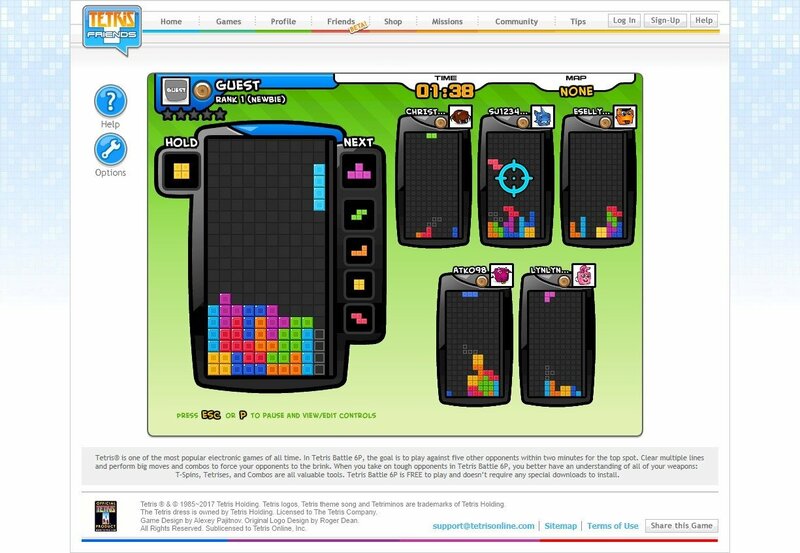 You won't stand a chance at 6-player Tetris until you get some practice in so why not play a free game of Tetris here on Tetris.com?